Having said so, I have chosen a game of mine recently played that features: a debatable kikashi, an interesting situation in the lower right corner with a variation whose developments could have been so nasty we didn't even dare to think about... (in fact that variation was left unplayed), a furikawari, some good fighting and... oh so many mistakes%%% I think mistakes are what make an amateur game a good learning occasion: as Peter Cook once said, "I've learned a lot from my mistakes: now I know how to repeat them". Comments, questions, answers are of course much welcome. We of course cannot tell which one is better or whether they're both playable. I probably would have played as in the game as well, because to me Black's pincers look less efficient in this position (any comment?). 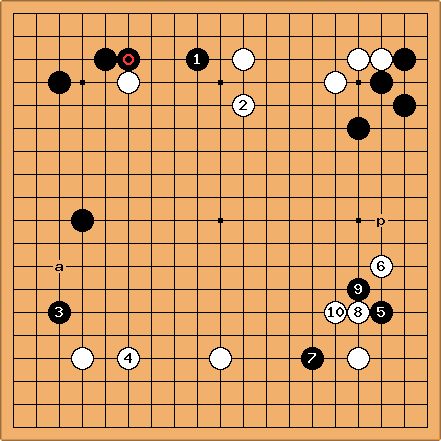 most of all, a could instead lead to the nadare: in this joseki white has always variations available to obtain influence that would work well with her ni-ren-sei on the bottom side. pwaldron: From a quick search through my database, the pros generally favour the high approach over the low approach in this position. Regarding your concerns about attaching underneath at a, a White extension to c is to be expected, but I don't think it's too bad for you. 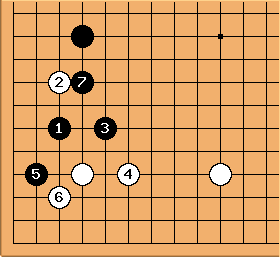 You correctly point out that the top side is a comparatively small one, so forcing White to develop in that direction is not going to be too bad. Taken to an even greater extreme, you might consider playing d as a response to the initial approach. And then Carlo played the kikashi at . The kibitzers of course debated very much on its utility. Carlo said that then it was the only moment to have it answered on the inside (at ) and he didn't doubt a stone there would have proven useful later. From my point of view, I wasn't feeling bad, as it reinforces my territory and allows me to extend all the way to c (in fact my next move). What do you think of this position? 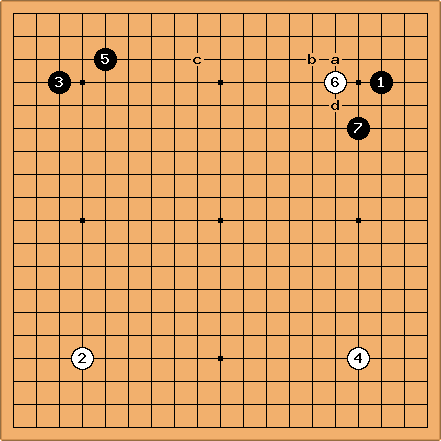 I thought it is somehow even: the UR corner is even (joseki by default are even, are they not? ;-)), and then there is Black' shimari + extension vs. White San-ren-sei: at my level I cannot assess which is better, so I have to think it's even. It's my turn, and then the RS is still to be played. 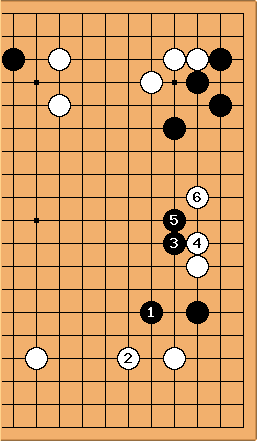 For the next couple of moves I felt I had the initiative: (just the right extension from ) is almost sente (else White is in for a nasty invasion ), does more for Black than does for White (or am I an unsound optimist?). Procrastinator? : at p or similar looks interesting to me. Anyone care to comment? 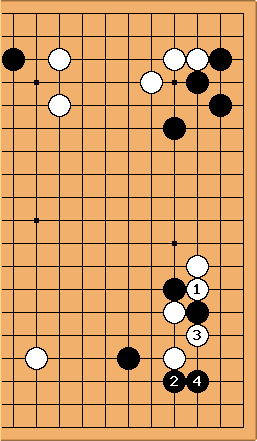 Playing the aggressive brings disaster for White: in the second diagram is necessary, else Black a, and then Black ataries atb. 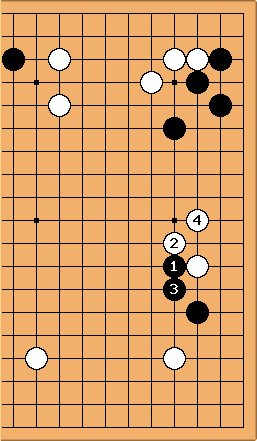 Then makes miai of c and d.
To avoid this White has to play at a in the first of these two diagrams and let Black connect at W0 there, but this still leaves a cutting point at b.